Scientists are puzzling over what is described as a "missing jigsaw piece" in climate research - the role of dust in global warming. With huge plumes of particles rising into the atmosphere from deserts and farmland, the question is whether they raise temperatures or lower them. Massive dust-storms recently engulfed major cities in the Middle East. So researchers are investigating whether a warmer world will also become dustier. Prolonged drought in the US state of Oklahoma over the past few years saw a return to conditions that resembled the infamous Dust Bowl of the 1930s. A recent estimate suggested that about 40% of the so-called aerosols released into the air every year is made up of mineral dust. Some of it comes from human activity, such as ploughing or grazing arid land or diverting rivers leading to the drying-out of water bodies such as the Aral Sea in Central Asia. But much atmospheric dust is naturally created on bare land in quantities that are governed by a combination of factors including rainfall, geological source and wind speed. The largest source of dust in the southern hemisphere is the Etosha Pan, a vast area of baked ground in Namibia in southern Africa. This spectacular landscape is periodically flooded and the waters leave a rich sediment that is then left to dry under the tropical sun. The pan lies at the centre of Etosha National Park, a major tourist attraction which hosts abundant wildlife - we saw elephants, giraffe and a herd of zebra thriving on apparently barren terrain. Clouds of dust rise on a scale that's visible from space, with satellite pictures capturing the dust billowing off the pan and then being carried for hundreds of miles over Namibia and then out over the Atlantic Ocean. To try to understand how much dust is created from this one natural feature, and the precise conditions that determine when a dust plume will form, a British and South African team has been gathering data for the past three years. At several locations around the pan, researchers established arrays of instruments ringed by fencing to keep away curious animals. 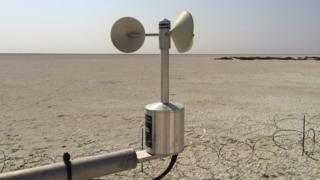 The devices have been measuring everything from the wind speeds to the quantities of dust carried at different heights above the ground to the thickness of the plumes themselves. One of those involved in the project is Prof David Thomas of Oxford University, a veteran researcher of some of the world's dustiest areas. Speaking in the ferocious heat of the southern hemisphere summer, he told me that climate models lack a precise role for dust which could potentially limit their accuracy. "Dust is one of the missing jigsaw pieces in climate modelling," he said. "On the one hand, more dust in the air could mean less incoming short-wave solar radiation and less warming while, on the other hand, the blanket that the dust could provide in the atmosphere could reduce the loss of heat and that could mean more warming. "More dust in the atmosphere could mean more heat trapping, particularly at night so it's a difficult situation to understand." The aim of the project is for the first time to gather data at a major source of dust in a way that allows it to be used in climate models. This would be useful because of the multiple roles of dust in the climate system: not only does it reflect or trap heat but it also acts as a fertiliser for plankton in the oceans, which then acts as a carbon sink. These questions will become even more relevant if rising temperatures themselves trigger the release of yet more dust into the atmosphere. The UN's Intergovernmental Panel on Climate Change (IPCC) reported in 2007 that simulations of future dust emissions were highly uncertain, with a vast range of scenarios - some of which point to less dusty conditions while others suggest a big increase. Studies by the US Geological Survey suggested that warmer conditions in the southwest US could accelerate the loss of grasses and therefore increase the production of dust. The authors concluded that the key factors included the future wind speeds and resilience of local vegetation. Asked whether global warming could lead to a dustier atmosphere, Prof Thomas said: "It's not possible to say - what we do know is that human activity at the surface is potentially creating environments where more dust can be generated." In the Etosha Pan, Prof Thomas and his colleagues have found that strong winds are not enough on their own to guarantee surface material will be dislodged. Also important are a series of relatively wet years to bring supplies of fresh sediment, together with rainfall that is intense enough to break up the surface. Walking over the pan is rather like stepping on to very thin ice, with each footstep crunching through a thin and brittle surface, exposing a layer of dust below that is so fine that it resembles powder. It is this dust, light enough to borne by the wind, that goes on to form the plumes that flow high into the atmosphere. Regardless of the effect that dust may have on the climate, dust itself can pose a significant hazard to human health. "The obvious impact is on respiration and you get an increase in respiratory diseases," Prof Thomas said. "But dust can also be a carrier of pathogens so in effect it can be very bad to live downwind of major dust sources." The research project, known as DO4MODELS, involved scientists from the universities of Oxford, Imperial College London, Sheffield, Southampton and Cape Town.